There’ll probably be a few thrash purists choking at this, but despite the increased grooviness which seems to infect all modern bands of the genre, Omega Wave is a great comeback for the band. 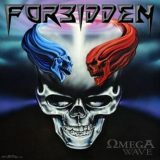 Forbidden came in at the end of the eighties, releasing some very-well-received thrash that stood out from the crowd due to vocalist Russ Anderson’s unusual habit of actually singing, yet the band gave it up in 1997, reuniting briefly for Chuck Billy’s benefit concert, before reuniting properly in 2007. And I’m glad they did, for Omega Wave is a stomping thrash beast that deserves your ears, from the epic introduction to the last notes of the closing title track. Thanks to former Nevermore member Steve Smyth and original guitarist Craig Locicero, the guitarwork is truly outstanding, first track proper Forsaken At The Gates aggressive and melodic, like a sped-up version of Smyth’s former band in many ways. The following Overthrow is more pounding at first before switching back to melody and an almost balladesque centre section, yet it’s not a patch on the album’s best song, the tech-thrash meltdown that is Adapt Or Die, mixing power metal vocal histrionics with a storming set of riffs, leading to something somewhere between old Anthrax and old Iced Earth. Of course, some will look down their noses at that, and it’s up to them. But it’s hard to complain about most of the material present, like Swine, which sounds like Alice In Chains after they’ve been listening to lots of Crowbar, before turning into a thrashy riffathon par excellence. Dragging My Casket is a big epic metal ballad with sections of intense thrashing, Hopenosis a crushing paean to a certain American President, and Immortal Wounds another truly excellent track present with duelling light and harsh vocals to epic effect. Admittedly, there is fat that could be cut from the album’s hour-plus running time – the two minute interlude Chatter is pointless, for example. Yet all in all, the band use their time excellently, even songs towards the end of the album like the prog-tinged Behind The Mask and Inhuman Race more than worthy of your ears. Omega Wave is ultimately a triumphant return for a much-missed band, and proves they still have what it takes.